Any parent will tell you that one of the scariest times of their life is when they first hand the car keys over to their teen, but some automakers are offering a way for parents to monitor and place limits on their teen’s driving behaviors. Car crashes are the number-one killer of teens with speeding, lack of seat belt use, drinking, and distraction as contributing factors. Consumer Reports looked at four manufacturer systems that aim to help curb those dangerous behaviors: Ford MyKey, GM Family Link, Hyundai BlueLink, and Mercedes-Benz mbrace2. Program a top speed up to 80 mph, with chimes when the car goes to 45, 55, or 65 mph. Screen and block explicit radio stations available on satellite. Sets off a chime when a seat belt isn’t fastened and also prevents the radio from going on until the driver buckles up. 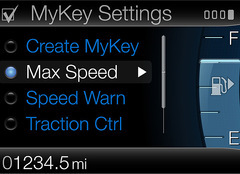 Set the low-fuel warning at an earlier level, so instead of 50 miles to empty, you can change it to 75 miles. Driving aids such as blind spot, park aid, and traction control cannot be deactivated. GM’s Family Link is part of OnStar and costs $3.99 a month on top of the OnStar subscription fees. It allows parents to find their teen’s car on a map on their website and receive a text or email as to their whereabouts. Parents can set a time to receive an alert, which is helpful to verify they arrived at their destination safely. Hyundai BlueLink is similar to OnStar in that it keeps track of the vehicle and driver’s safety in an emergency. For $179 a year, you get roadside-assistance features in addition to teen safeguards, such as a speed alert, geo-fence, and curfew alert. This allows parents to set these boundaries on the car and to receive a message when they are overridden. Mercedes-Benz mbrace2 has the same type of vehicle assistance and teen safety features as BlueLink. It adds an interesting feature called Safe Ride that allows the driver to signal they need help getting home, such as if they are tired or intoxicated. Safe Ride calls a parent or a taxi, as needed. The cost for mbrace2 is $280 a year and $20 more for mbrace plus, which adds a geo-fence, speed alerts, driving journal, and travel assistance. These in-car features are a good way for parents to have peace of mind when sending their teen out on the road. The fees can sometimes sound expensive for these services, yet in reality, most families would probably use them just for a couple of years and they do come with additional benefits. Of course, most parents don’t necessarily buy a new car for their teen, but when sharing a family car (which saves on insurance), teens can benefit from these potentially life-saving services.